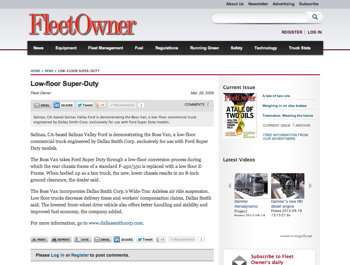 Check out this FleetOwner.com article, which highlights a Dallas Smith Corp® lo-floor™ suspension (Z-Frame). The article discusses how a Dallas Smith Corp® Z-Frame™ suspension can bring the chassis height as low as 8 inches from teh ground. The article also discusses how such a suspension can provide better handling, stability, improved fuel economy, decreased delivery times and workers’ compensation claims. 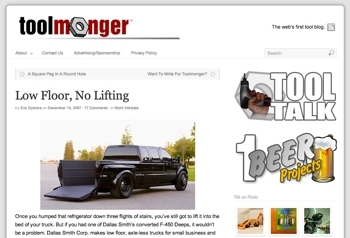 ToolMonger.com highlights “Ford Deep” and the Dallas Smith Corp® Axleless® Suspension that goes along with it! Check out this article written by ToolMonger.com. The article highlights DeBerti Designs’ Ford F-450 Deep, which is equipped with a Dallas Smith Corp® Axleless® Suspension, a design that took home Ford’s Best of SEMA Show Award at the 2007 SEMA show in Las Vegas.